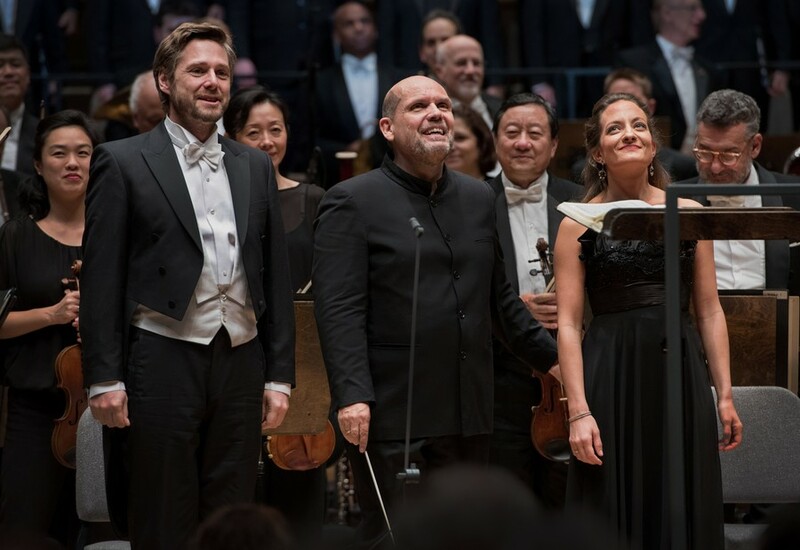 Soloist Michael Nagy, conductor Jaap van Zweden, soprano soloist Christiane Karg in front of the Chicago Symphony Orchestra. Perhaps the least-known war in the second half of the 19th century took place between musicians. The “War of the Romantics”—an admittedly melodramatic term—raged between the conservative-minded composers championed by Johannes Brahms, and the radical mold-breakers, searching for a new harmonic language, championed by Richard Wagner. This weekend’s performances at the Chicago Symphony Orchestra (CSO) put these opposing sides into conversation with two of their greatest canonical representatives, Wagner’s “Prelude and Liebestod” from Tristan und Isolde and Brahms’s Ein Deutsches Requiem (A German Requiem), along with Mozart’s Maurerische Trauermusik (Masonic Funeral Music). The Mozart provided a gentle entry point for this program of death and remembrance. The piece was written in 1785 for the funeral of two aristocratic Freemasons (Mozart was a Freemason himself). The CSO’s playing of the piece was both colorful and stylistically faithful. Conductor Jaap van Zweden displayed his keen sense of shaping, following the musical lines by subtly highlighting specific instruments. Special praise goes to the low winds, basset horns and contrabassoon; they played with tremendous confidence, giving the orchestra’s timbre a thrilling and appropriate growl. The Prelude to Wagner’s Tristan und Isolde showcases some of the composer’s most revolutionary harmonic innovations, particularly the “Tristan chord.” A bitterly dissonant chord that remained unresolved for much of a five-hour opera, the Tristan chord shocked contemporary listeners. The remaining music from the opera featured by the Prelude and Liebestod (a standalone orchestral piece) displays Wagner’s signature lush harmonies and gushing phrases. In a brilliant moment of metaphorical painting, the resolution to the Tristan chord comes in the “Liebestod” (“Love-Death”), concurrent with the moment when Isolde dies, symbolizing the double romantic and spiritual release that occurs when her love for Tristan comes to a tragic end. The CSO performed this work with visible passion. The strings, in particular, played with a luxurious, sensuous sound that was perfectly befitting the music, both stylistically and expressively. Van Zweden's interpretation was sophisticated and beautifully wrought. Musical ideas from the opening bars, such as the elongated F after a major sixth, were carried through the performance in such a way as to create dramatic tension and maximize musical interest: a bit of a subtle observation, but one that added to the piece’s unity. The orchestra itself was fully invested in these designs and played the enormous climaxes with chill-inducing intensity. The highlight of the evening, even after the exceptional first half, was Brahms’s Ein Deutsches Requiem. The work was premiered in its complete form in Leipzig in 1869, shortly after the death of Brahms’s mother. Holding to his conservative ideology, Brahms included two large-scale fugues at the conclusion of movements, complete with Bach-style sequences. Especially fascinating about the piece is the lack of Christian content in the text, unlike the Kyrie, Lacrimosa, and Domine Jesu in the traditional Latin Requiem. In fact, Brahms himself said that he might have called the piece a “Human” (“Menschliches”) Requiem, rather than a “German” Requiem. The use of German is itself a nod to humanism; Brahms finds himself participating in the complicated history of the language’s sacred usage, going back to Martin Luther’s translation of the Bible. Though all participants delivered first-rate performances this weekend, baritone Michael Nagy exhibited a truly stellar performance. His voice carried tremendous power and beauty in sincere, heartbreaking prayer, and then with zeal and immediacy in describing the moment of judgement. His interpretations did justice to Brahms’s unpretentious and profound vision of human life and death. Soprano Christiane Karg also gave a fine performance, with elegant phrasing and clear interpretive communication. The CSO excelled throughout—particularly in the fourth movement, where van Zweden once again showed his interpretive prowess by fully “playing” rests to punctuate Brahms’s complex orchestral textures, allowing for moments of silence that refreshed and engaged. These pieces display three completely different views on death: for Mozart, somber and understated; for Wagner, enormous and high-Romantic, a release of spiritual tension; for Brahms, at once serene but also glorious. The program, curated as such, offered the audience a moment of reflection, an escape from an otherwise tumultuous week.